This is an old one. Maybe the first one I did when I thought about doing a fanzine again, back in 2000 or something like this. “Get A Load of This” was on heavy rotation on my player and I was thinking “How nice it would be to ask a few question to this gentleman”. I eventually got in touch with Dave thanks to Jim Stephenson (thanks a million man!) and what started with an interview developped into what i’m proud to call a transatlantic friendship. How could I imagine when I sent my email to “Pappy” that more than ten years later I would draw the cover of his jazz album? Dave Stuckey – I was born and raised in Kansas City, an easy place to get interested in music history… as you know, KC has a terrific music past, from the great jazz clubs at 12th & Vine streets, Joe Turner, Count Basie and Charlie Parker to the country/rockabilly label Westport Records… they even had a «Barn Dance»-type show in the 30’s and 40’s called «The Brush Creek Follies»! It was a wide-open, New York type of town back then — during the Prohibition Act in America, Kansas City had more than 300 bars (called «Speakeasy’s») ! As a kid one of the first things I did when I got my drivers license was head downtown to Union Station, where you could still see the bullet holes from a shootout Pretty Boy Floyd had with Federal Agents when he was trying to spring an accused bootlegger in custody. Anyway, I got a little off track there… but that gives you a sense of the great ghosts that are floating around in Kansas City. Dave Stuckey – This is funny — the first record I remember GETTING is «Sugar Sugar» by the Archies — it was a cardboard record cut out of the back of a box of cereal ! The first 45 record I bought myself… was «Monster Shindig» on Hanna Barbera Records, a kid’s label. The first LP… well, there were actually 3. There was a department store in KC that sold LP’s, I had some money from cutting grass or something… and bought «Golden Bisquits» from Three Dog Night, «Meaty Beaty Big & Bouncy» by the Who and Creedence Clearwater Revival’s «Green River». Man, this could be EMBARRASSING! What is the first instrument you played? Drums or guitar? 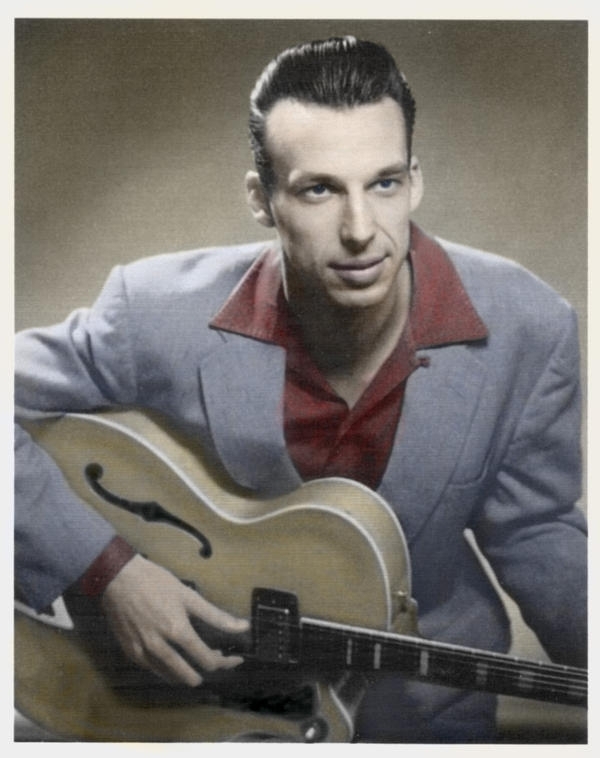 How did you discover rockabilly and all that kind of music? But my first year of college (in Denver, Colorado) I discovered an even better store called Wax Trax. It was a treasure trove of new and used records, 45’s and LP’s (can you believe it? CD’s hadn’t caught on yet!). At any rate, in 1978 I was buying some punk 45’s or something one day and the guy at the counter said ‘you think this stuff is wild — you should try *this*’. He reached behind the counter and pulled out the ‘Chess Rockabillies’ LP that had just come out… I took it back to the dorm and it really blew my mind… I mean *really*. Rusty York’s «Sugaree», G.L. Crockett’s «Look Out Mabel» — I was on the ceiling! Do you remember the first band you played with? Can you tell us a bit about «The Regular guys»? Dave Stuckey – Yes. That ties into my college degree, Radio/TV/Film. When I graduated, I came out to Los Angele to make documentaries with Gilman, who was a friend back in Kansas (I took his place in the Regular Guys when he left for California). We first did a 3 Stooges documentary called «The Funniest Guys in the World», sold that, and then did the Lugosi docu. And some other things. They’re pretty hard for me to look at now – I’ve learned a lot more about the production process since then — but we did get to meet and work with old Hollywood legends like John Carradine and Ralph Bellamy. Our company more or less dissolved after that and I went on to get more work as a film/TV editor, which I still do today. Music videos, movie trailers, infomercials, you name it…I’m crazy about old movies and TV, so this job is a decent way to work in the same.. uh.. «arena». That leads us to other Bela Lugosi fans: Lux and Ivy. What is your connection to The Cramps? Lux and Ivy are known to be great records collectors. Are you one yourself? Dave Stuckey – Oh yeahm it’s a sick habit! Actually, Lux and I used to go record hunting together at a monthly Swap Meet in Pasadena, CA. I have to say that since he’s heard about everything, Lux turned me on to more fantastic 45’s I never would have thought about otherwise…So, yes… I’ve got a lot of LP’s, 45’s and 78’s… also a ridiculous amount (over 1000 hours) of old TV shows and movies on videotape… comics, pulps, books… sigh. Let’s talk about the Dave and Deke Combo. How did you met Deke? 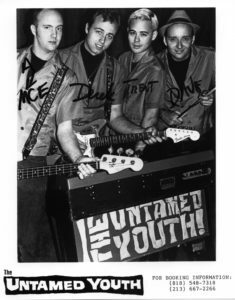 The Untamed Youth, circa 1992, with Mace, Deke Dickerson, Trent Ruane (the Mummies) and Dave Stuckey. 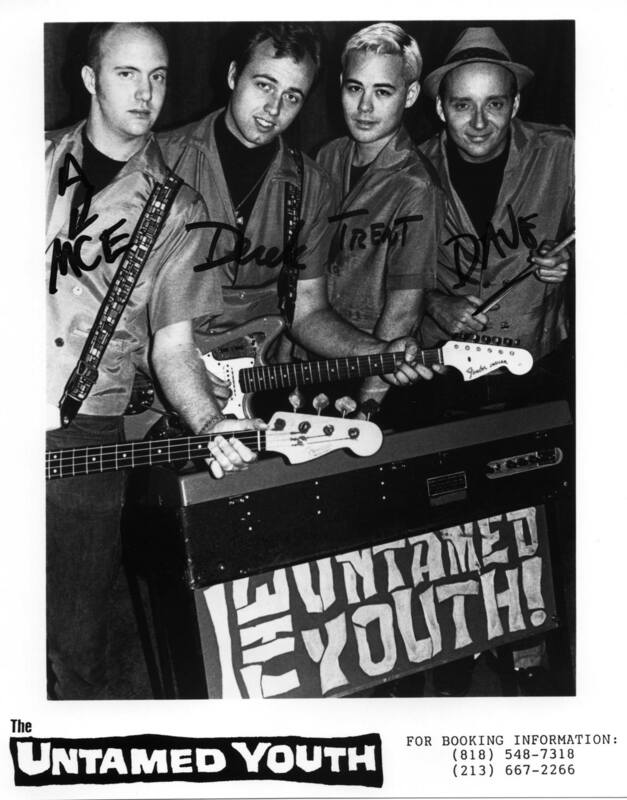 What was your first band together, Dave & Deke or Untamed Youth? 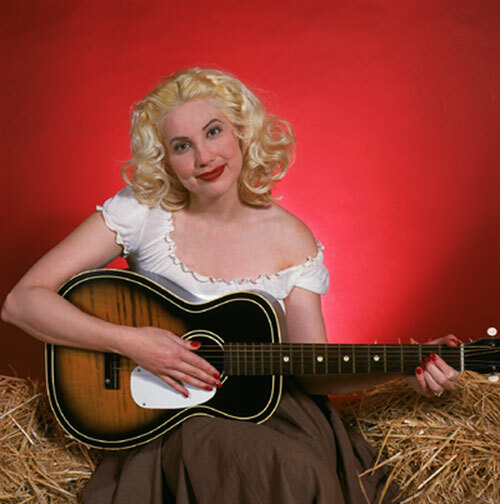 You started around 1991, we can’t say that the american rockabilly/hillbilly (and so on) scene was in good health at that time. Wasn’t that too hard? Dave Stuckey – Well, California was a little bit different, I think. We had a little scene that grew quickly because we had a bar to hang out at, The Blue Saloon, which was run by our bass player, Lloyd Martin. The few bands that were around had a tight knit group that played the same gigs, went to the same backyard BBQ jam sessions and had the same crowds… Since Dave &Deke and Big Sandy shared Bobby Trimble as a drummer for about a year (before Lance), we would often all pile into Wally Hersom’s van and head down to San Diego or up to San Francisco for shows… What a riot that was! So there became a point when you could go to the Blue Saloon on any night of the week and see rockabilly and/or surf music! Sunday night was Dee Lannon & Her Rhythm Rustlers, Monday was Russell Scott & the Red Hots, Tuesday was Deke’s Untamed Youth spin-off band (called The Beatnik Bandits), Wednesday was Dave & Deke, Thursday was Big Sandy and Friday & Saturday were usually touring bands like Sleepy LaBeef, Rudy Grayzell, Rose Maddox and Ronnie Dawson ! With lineups like that, you can see how the scene was very big in Southern California (for a while anyway — it didn’t last). 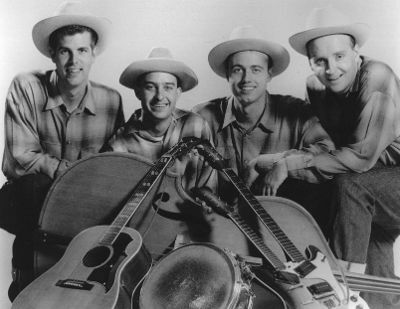 Bobby Horton said «This music wasn’t played that well until three bands came along–Big Sandy and the Fly-Rite Trio, the Dave and Deke Combo and High Noon. I believe those bands have really spearheaded this current scene and deserve a lot of the credit. They were writing original music and had great musicians in their bands.» Do you think, that you helped a new scene to emerge? Then, just after a superb second album «Hollywood Barn Dance», you went your separate ways, why? 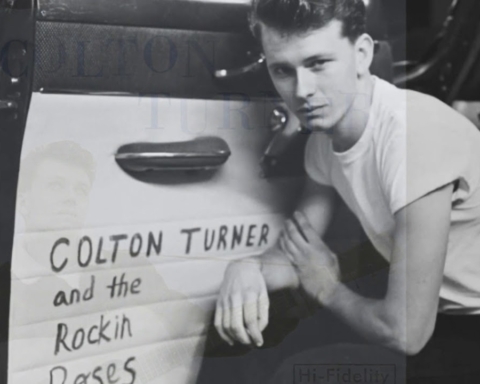 Dave Stuckey – I think the main reason was that Deke wanted to do his own thing – and I understand that… I found that, the more I played, the more «traditional» I wanted to get… Deke has always had a deep love of rock n’ roll (I mean real, 50’s rock n’ roll, of course, not the weird definition that exists today), along with other kinds of music. He wanted to «mix it up» and I just wanted to get more and more hillbilly. I understand the conflict, for sure. It was too bad, since the band was just beginning to really get some interest after the 2nd CD… but some of us could tour a lot and some of us had day jobs… it was just one of those things.And while I didn’t want it to end at the time (since I felt that we had put a lot of work into it), if it *hadn’t* broken up, I would have never met Whit Smith, who is a huge influence on me, Elana, all the other folks in Austin I’ve gotten to play with and most of all — I’d have never gotten to play with Jeremy Wakefield, which I think is the most fun I’ve ever had. 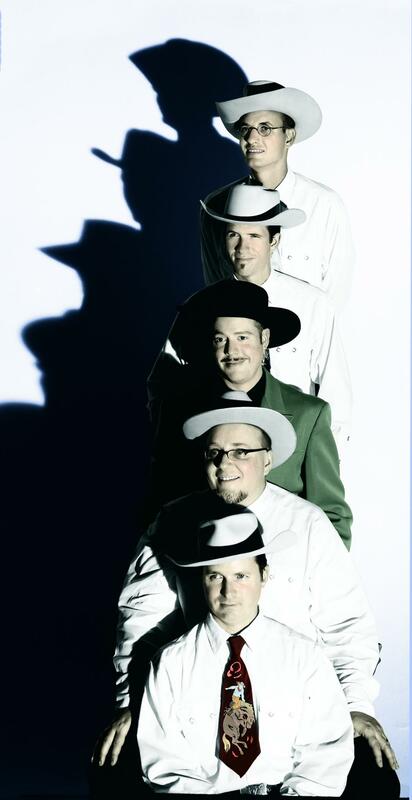 After the Dave and Deke Combo, you fronted your own band and played western swing ? Was it something you wanted to do for a long time? Wasn’t that too hard to reunite this (killer) line-up? Dave Stuckey – It was incredibly hard! Once we decided we were going to do the HMG record (after the initial get-together), it took a YEAR to get everybody back in Austin at the same time to record again! By that time, Kevin was just too busy, so Jake Erwin stepped in and really nailed it. 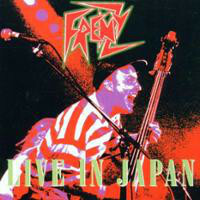 Was everything done «live in studio»? Dave Stuckey – That’s right – in Billy Horton’s living room – he’s long since built a real studio in Austin (which sounds amazing). Is there unreleased stuff from that session? Dave Stuckey – I think there are two songs we didn’t release and both are from the first session. 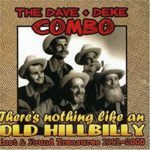 The Wills cover «Whoa Babe» and a new western swing style version of the Dave & Deke Combo song «Did Anybody Mention My Name?» I haven’t thought about those songs in a long time! I must have them someplace… I think everything we recorded in the second «official» session was released. We only had a week to record, mix and finish so we were really rushing to finish. Will you release other things on these label? Dave Stuckey – Man, was that fun ! I was flattered that they asked… We all went up to New York and recorded it. I was very happy with the way that one turned out. You co-wrote some songs with Whit Smith. How did you work together? If you could choose, who would like to produce? Dave Stuckey – That’s a good question ! Frankly, I’d love working with them again, because I admire their musicianship — and influences — so much…I would’ve loved to work with friends like Ray Condo, but never got the chance, God bless ‘im ! There are also some traditional jazz bands around southern California that I really like and would love to produce, like the Rhythm Rascals (who are a jazz band with John Reynolds, one of the best 30’s style guitarists going and his brother Ralf on washboard! ), but that’s a whole another scene I don’t really have many connections with. Then you joined The Lucky Stars on drums, how did it happen? Dave Stuckey – Sage was hard up for a drummer! Actually they did have a vacancy and he asked a few years later and I’m still in it. It’s great playing with JW, Russ Blake, Wally Hersom and Sage in this thing I get to sing a little, play some drums and have a few laughs. Was it the first time you re-play drums since the Untamed Youth days? Dave Stuckey – It sure seemed like it! I hadn’t played for 3 years at the time (the last being a sit-in gig with the Ray Condo band in 1996) I felt very rusty for a while there, but got used to it. Do you write and/or sing material for The Lucky Stars? Dave Stuckey – Well, the Lucky Stars are chiefly Sage’s project ! JW and I both sing some and that’s fine. You told me your 3 favorites drummer were Ray Bauduc, George Wettling and Dave Tough. What do you like in their style? Dave Stuckey – Well, I haven’t thought about putting it in words until now, but what I like about these guys has as much to do with what they don’t play! The common thread is syncopation and sparse fills played with unique accents. I love it when the fill doesn’t come at the point you think it going to come ñ in other words, playing in between and around the rest of the rhythm section. You know, it’s hard to remember that traditional jazz drumming is about dynamics more than pure time-keeping.Bauduc, Wettling and to a somewhat lesser extent, Tough have this style, which I find thrilling and adventurous. You can find the same thing on the country side with Muddy Berry (who played with the Tex William’s Caravan) and Smoky Dacus, Bob Wills’ drummer in the 30’s. I can only aspire to this kind of style, but trying to get close has rejuvenated my interest in drums the last few years. What is your drumkit, it seems pretty old ? Dave Stuckey – It’s a 1928 Ludwig and Ludwig set the snare and bass drum anyway. I’ve tried to surround it with hardware and cymbals, nothing newer than 1947, it’s really fun to try to track this stuff down but hard! Can you tell us more about the Bonebrake Syncopators? Dave Stuckey – The Syncopators were a project put together by JW (Jeremy Wakefield), TK Smith (from the earliest incarnation of Big Sandy & The Fly Rite Boys), DJ Bonebrake (from the legendary L.A. punk band X) and Wally Hersom. They were a drum-less quartet for the first year or so, after which I horned my way in there, playing snare with brushes mostly. Do you sing in that band too? Dave Stuckey – Yes, JW and I split the singing duties that wind up about 50/50. Do you write original songs for this band or this is only a cover project? Dave Stuckey – So far we’ve been content with the great American standards (and some Django too! ), though TK has written a great instrumental we do called «Diggin’ for A Donut» great title, huh? 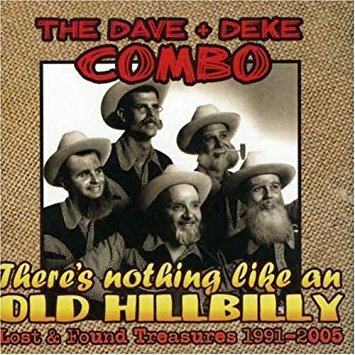 A Dave and Deke Combo reunion is in the air, who’s got the idea ? Will you record something ? Dave Stuckey – I think we all knew at some point we’d do a reunion. Tom Ingram (Viva Las Vegas’ organizer along with our old friend Barney Koumis) had asked a few times over the years, as had Marc Mencher, the guy who books the Green Bay festival, but it just never seemed like the right time. Mencher got on my case last spring and was really determined to make it happen. When Tom got word, they both ganged up on me until I finally hollered «uncle»! No, seriously it just seemed like it was the right time to do it and by agreeing to both shows, we get to use both bass players that have done time in the Combo, Shorty Poole in Vegas and our first bass plucker Lucky Martin in Green Bay. That way nobody gets left out. You’re busy drumming, but what about Dave Stuckey the singer? Do you still gig? Will you record something soon? 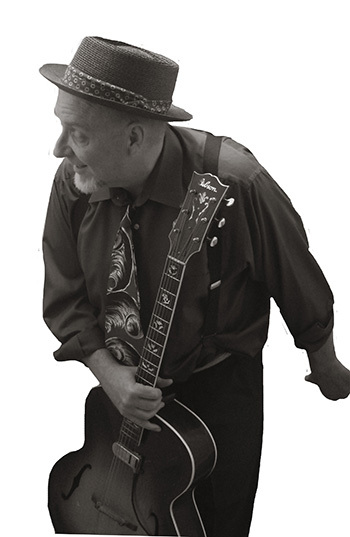 Dave Stuckey – It’s funny, I haven’t played as a front man since I went to Japan and was backed by the fabulous Japanese Western Swing band Rollin’ Rocks (in 2001 was it?). A lot of it stems from the fact that it’s real hard to put together good musicians that play the kind of music we love and the ones that are there usually are just too busy to add another thing to their plate. If the inspiration strikes, I might do it again or maybe front a band from behind the drum kit! Until then, I can get my kicks playing with good friends like JW, TK and the rest. Listen to this song from Pappy’s latest recording and then order it on cdbaby. Share the post "Dave Stuckey (aka Dave “Pappy” Stuckey)"